Brief summaries are given of the computer codes prepared at JAERI for the computer simulation calculations of the nuclear spallation reaction and for the nuclear design analyses of accelerator target/blanket systems for the trans-uranium waste incineration. 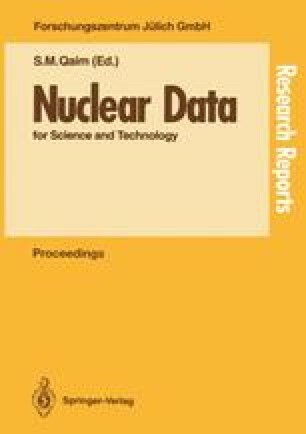 Nuclear and nucleon data needs are reviewed for developing computer code systems and for making design analyses of the intermediate energy-high intensity beam proton accelerator and the incineration system. A model incineration system and its performances are described. The proton energy has been taken to be 1.5 GeV. Two types of the systems have been investigated: the single composition type similar to the LMFBR assembly and the hybrid type. In the hybrid system the tungsten target is surrounded by the trans-uranium blanket. This system has been employed to make the power density distribution flatter. The neutronics and thermal-hydraulics analyses have been performed for Na cooled and Pb-Bi cooled assemblies. The allowable beam current is larger for the Na cooled assembly than for the Pb-Bi cooled one. The maximum incineration rate has been obtained for the tungsten loaded, Na cooled assembly, in which the proton beam of the energy 1.5 GeV and the current 22.6 mA bas been estimated to be able to incinerate the TRUW from 7.6 units of the 3,000 MWt, LWR. Design studies of the engineering test accelerator (1.5 GeV, 10 mA) are being carried out at JAERI.